A wrought iron fence can give you peace of mind and add security to your property. Iron is one of the most durable fencing materials available. Wrought iron fences look nice and they add a great layer of protection to your property. These are only a couple of the great benefits of using a wrought iron fence to secure your property. As long as its well cared for, a wrought iron fence could last for decades. Even though it lives outside, this durable material can withstand years of harsh winters, sweltering hot summers, and corrosive moisture. As with anything else, there is always a chance of damage. If you don’t care for your wrought iron fence properly, it will rust, bend, and sag. If this happens, your fence is no longer a beautiful extra layer of security; it’s just an eyesore. Treat it well, and it will secure your property for years to come. Unfortunately, moisture is iron’s worst enemy. Water causes oxidation and rust, which causes your wrought iron fence to deteriorate quickly. Using a protective paint with a good sealant will help to secure your fence from moisture damage. Be sure to seal it as soon as it’s installed. Talk to your fencing company, they may even be willing to apply the sealant for you. The heavy steel construction and ominous stature of a wrought iron fence will have potential intruders re-thinking their plans. There are no chain-links for footholds, so climbing a wrought iron fence is super difficult. If they attempted to jump it, they would make A LOT of noise. Also, a lot of wrought iron fence designs have spikes at the top and that creates its own set of problems. 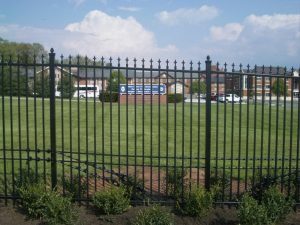 Add that extra security to your property today with a wrought iron fence! This entry was posted on Friday, June 9th, 2017 at 2:06 pm. Both comments and pings are currently closed.